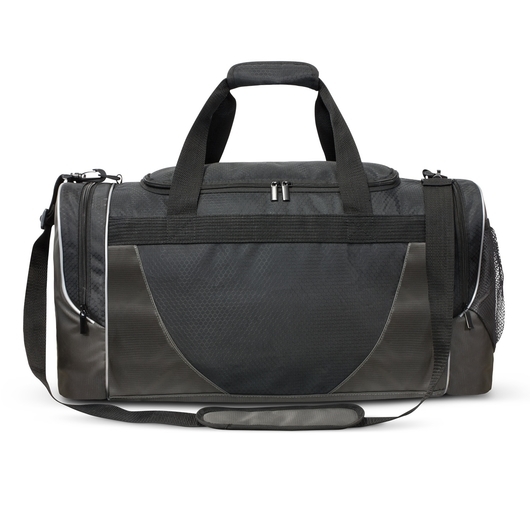 A premium gunmetal and black coloured duffle bag that's versatile enough for nearly all situations. 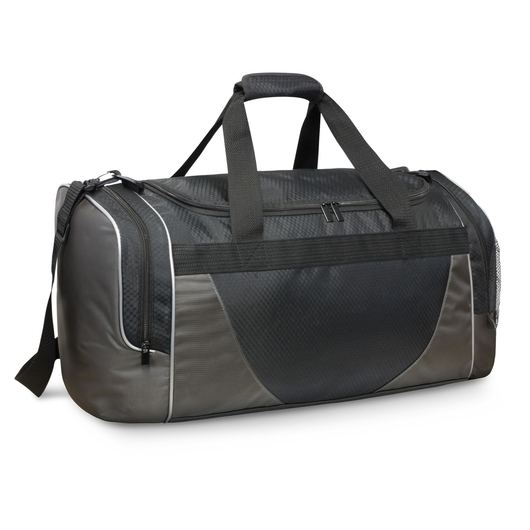 Instantly put your logo on people's minds with some of these superior large duffle bags. They're made from gunmetal coloured 600D polyester and feature a decorative black ripstop nylon accent and contrasting silver piping. They're great for any type of travel or sporting teams due to their high quality material and large capacity. They host strong carry handles with a Velcro cuff as well as a woven shoulder strap which is adjustable and removable. Other features include: 2 zippered external pockets, one of which is a shoe bag that can be used for wet gym gear, shoes etc, external mesh pocket, sturdy internal base board and strong external plastic feet.